NOTE: The documents listed below are linked to a PDF file which can be downloaded and printed. You will need Adobe Acrobat Reader (a free program) to view and print these files. If you do not have this program click on the icon below for a free download of this program. 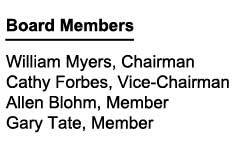 Board Meetings are held on the 2nd and 4th Wednesday of every month at 10:00AM unless otherwise specified. To view board meeting minutes from past years, click on the year below and from the drop down menu, select the date and then click on the "G0" button.